KIRKLAND, Wash., Nov. 29, 2017 – The 2018 Kenworth Calendar features beautiful images of The World's Best® aerodynamic, vocational, traditional and medium duty trucks in both scenic and work settings. 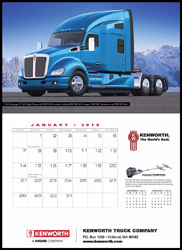 The new calendar is now available for purchase (www.shopkenworth.com). The 6-page, 2018 Kenworth Wall Calendar showcases the on-highway flagship T680 Advantage 76-inch sleeper equipped with the PACCAR Powertrain, as well as the T680 Advantage day cab. The vocational flagship T880 is shown in a tanker configuration with a 40-inch sleeper and as a T880S set forward front axle mixer. Also included are the W900L 72-inch AeroCab FlatTop sleeper and medium-duty group image of the T370 dump truck and T270 dry van. The large, poster-size wall calendar is 26-1/4 inches tall by 28 inches wide. 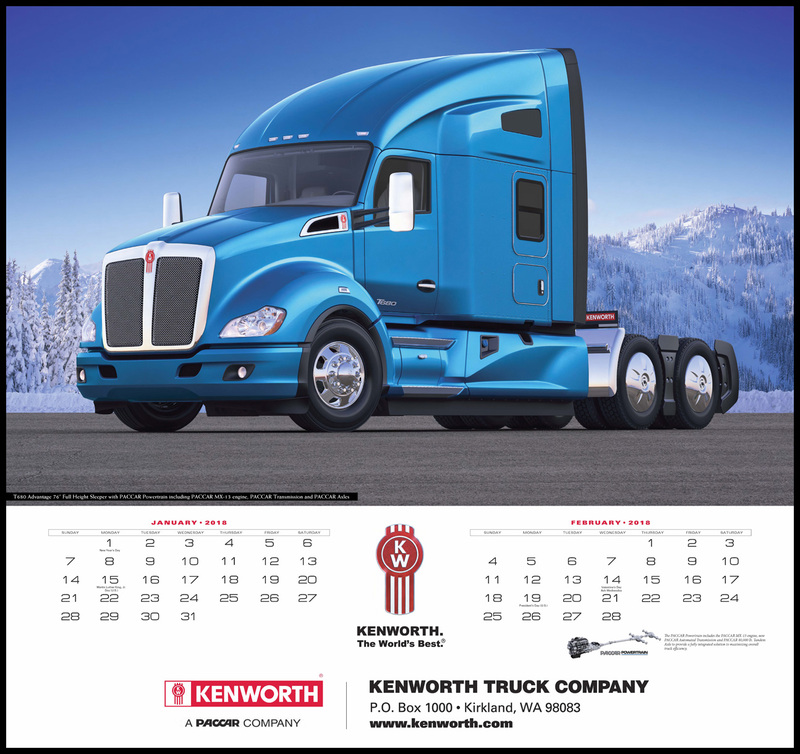 The 2018 Kenworth Appointment Calendar highlights a Kenworth Truck of the Month. These trucks include five of the wall calendar photographs. Also featured are the Super 963 with 122,000-pound carrying capacity, T680 Advantage models equipped with both the 76-inch full height and midroof sleepers, a T680 Advantage 52-inch midroof sleeper, a T880 and T880S dump truck image, a T880 heavy haul configuration, a T370 dump truck with 20,000-pound front axle and 46,000-pound rear axle, and a K270 cabover delivery truck. The appointment calendar is 9-3/4 inches tall by 13 inches wide. The T680 and T880 models in the wall and appointment calendar are equipped with the 12.9-liter PACCAR MX-13 or 10.8-liter PACCAR MX-11 engine. The medium duty trucks are specified with the 8.9-liter PACCAR PX-9 or 6.7-liter PACCAR PX-7 engine. 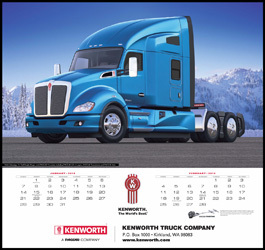 “Kenworth’s excellent lineup of high-quality heavy and medium duty trucks provide outstanding performance, low operating costs, and exceptional driver comfort for a wide range of customer applications, Drivers, customers, and truck enthusiasts will be proud to display the 2018 Kenworth Calendar featuring The World's Best trucks all year long,” said Kurt Swihart, Kenworth marketing director. To order, visit your local Kenworth dealer or go to www.ShopKenworth.com and click on “Calendars” on the left. 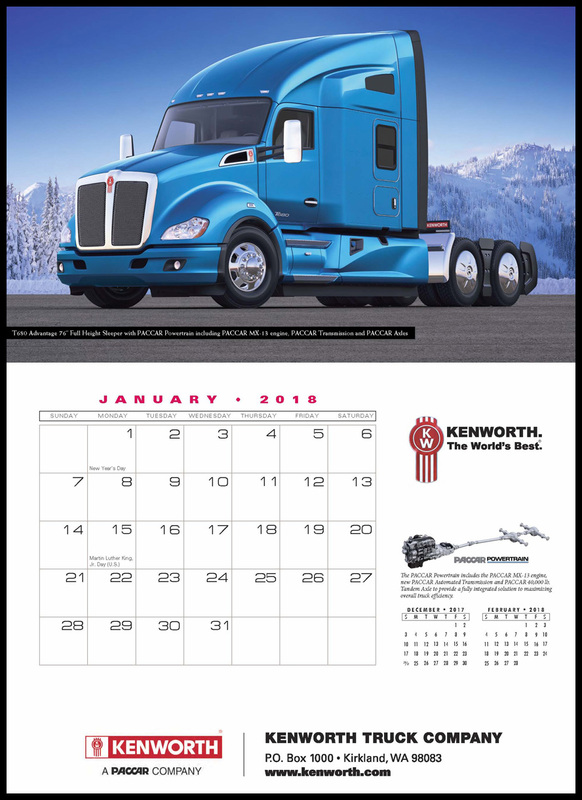 Cost is $16.95 (US$) for the 2018 Kenworth Wall Calendar and $11.95 (US$) for the 2018 Kenworth Appointment Calendar. Prices do not include shipping and handling. The calendar also may be ordered by calling 1-877-705-3314 (U.S.) and 1-425-806-2306 (International).